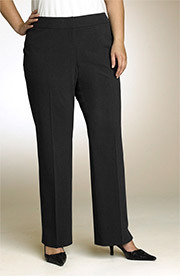 These slacks have a smooth fit because of the high contoured waistband and relatively sleek leg line. Unfortunately they still have side-entry pockets which is why they won’t work for everyone. But if you have slimmer thighs, give them a bash. And when you do, iron out the crease lines and sport perfect pant lengths please. The pants on this model are too short!